Being one of the most competitive markets out there, we know how difficult it can be to attract the best candidates, source all those sought-after clientele and ensure that the process goes smoothly. Being found online is clearly a good starting point, though when you’re competing with the likes of national businesses, appearing on page 1 is not an easy feat. Therefore, in today’s post, we’re taking a look at the recruitment agencies featured in our EmbryoGraph, to show them how they compare along SEO-related measures, such as number of keywords, domain rating, number of links and link quality. From this they’ll be able to see how they are performing, how they can improve and how they compare to their competitors. The recruitment agencies included independents such as Alexander Hancock, In Touch Recruitment and Fibre Talent, to larger operations with their head offices in Manchester, such as Rullion, Forward Role and Finlay James. *DR: Domain Rating according to Ahrefs. Our EmbryoGraph represents the number of keywords a website is found for by its circle’s shading, with the darker the shading, the greater the number of keywords. Targeted content with the right keywords allows you to rank better on the SEPP (search engine results page), leading to an increase in traffic as more potential candidates and clients find your website. Combining keywords with motivating language through your SEO/PPC campaigns is also an added bonus. Businesses that come out on top include Morson Group (23,300), Gradtouch (9421), Oliver James Associates (7649), Rullion (7358) and Meridian Business Support (5927). Companies that could do with updating their keyword strategy include Design Services (1), Marley Wright (8), In Touch Recruitment (13), Potential Recruitment (13) and Hatch Recruitment (20). 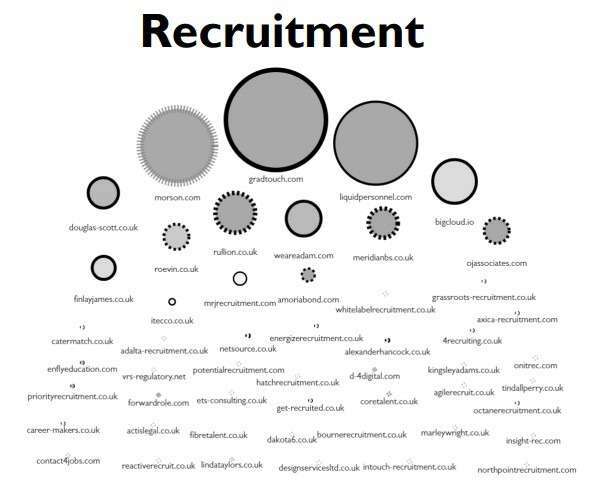 The strength of each recruitment website’s backlink profile is shown by the size of its’ circle. The larger the circle, the greater the number of websites that link back to that website, and the stronger the profile. As you can probably guess, search engines prefer quality backlinks (e.g. links from recruitment blogs, websites and other recruitment agencies) over poor backlinks, such as links from unrelated websites. Recruitment firms with the strongest backlink profile include Gradtouch (56), Liquid Personnel (51), Morson Group (48), Big Cloud Recruitment (37) and We are Adam (33). 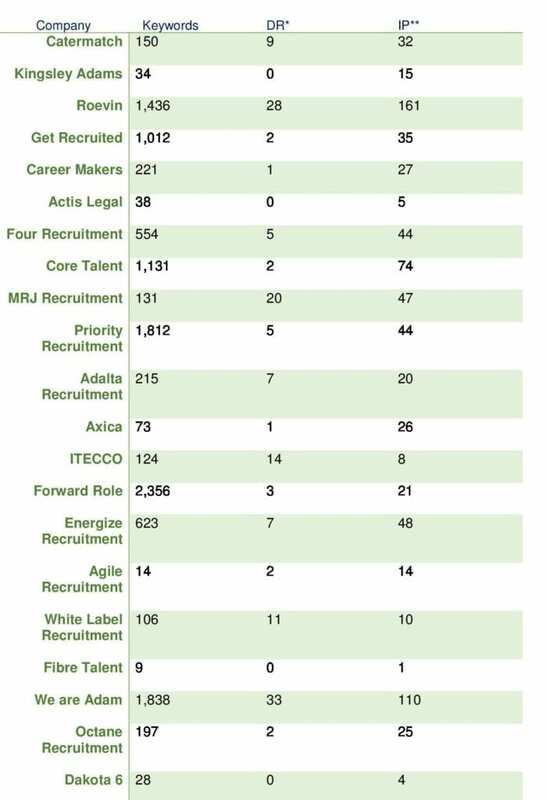 Companies with lower DR’s include White Label Recruitment (11), Adalta Recruitment (7), ETS Consulting Ltd (3), Agile Recruitment (2) and Career Makers (1). Kingsley Adams, Bourne Recruitment, Reactive Recruit and North Point Recruitment are among the businesses whose websites have a DR of 0. Border Thickness: The more links a website has. Solid Border: The website has good inbound link compared to competitors. Dashed Border: Link quality may be lacking in comparison. Businesses with the best IPs include Gradtouch (246), Big Cloud Recruitment (107), Finlay James (120) and Douglas Scott (134). Surprisingly, a lot of the larger companies have dashed borders, meaning they would be wise to work on their link quality. 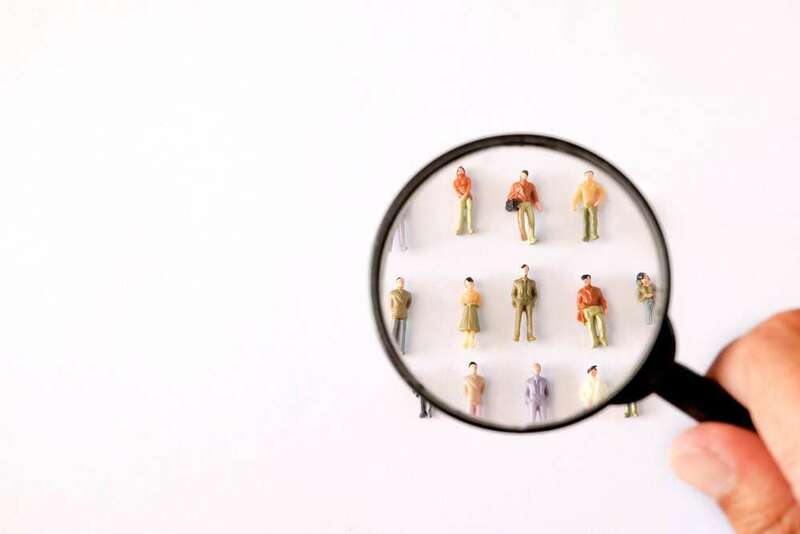 Recruiters may be experts in sourcing the right candidates for their clients’ jobs, but sourcing the right links and keywords for their own website may not come so easy. What follows are some quick tips for improving your SEO strategy, which will undoubtedly boost your website’s rankings, traffic and engagement. It may seem obvious, but before you create a new job listing, blog post or website page, choose 1-3 keywords or phrases that you think potential candidates or clients will use to find you, and then use them in your page’s title, meta-description and content. This will help you capture a vast range of searches, and by creating content that your audience wants to find or read, will keep them coming back for more. Also, because your candidates will be looking for jobs in multiple locations, and that Google likes to provide users with the most relevant search results to answer their queries, it’s imperative that you include location-specific targeted keywords in your URLs and job ad pages. Linking out to location-based pages on your ‘Home’ page or main landing page is also beneficial to the customer journey, ensuring they can find exactly what they need from the get-go. As mentioned above, search engines prefer quality backlinks, using them as a sign of trust and credibility to determine where your website should rank. We believe the best place to start your link building strategy is with your clients, who may be more than happy to link to your website, for example, through a ‘Welcome To The Team’ post. Especially if these clients have great website rankings themselves, it’ll help boost your rankings no end. Guest posting on websites such as Undercover Recruiter, LinkedIn Talent Blog, Recruiting Blogs and Eclipse Software. Find industry forums where candidates are posting questions and answer them, linking back to your website in the process. A FAQ section on your website is also good for clients and candidates in general. Create recruitment guides aimed at those looking for work after education and promote these to colleges and universities to feature on their websites. 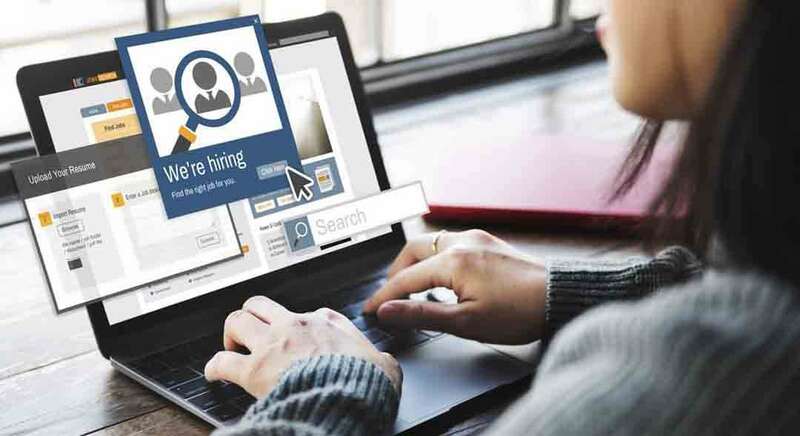 WHAT TRENDS ARE HITTING THE RECRUITMENT INDUSTRY IN 2019? According to Alexander Costello of Luminate, outbound marketing techniques such as online adverts, phone calls and even television adverts will take a backseat to inbound marketing techniques such as content creation (e.g. videos and blog posts), email and social media marketing. Building a knowledgeable and trusted brand presence through useful content will attract the best talent out there. Similarly, ‘On the Go Recruitment’ will see recruiters engaging potential candidates through their smartphones, as according to Helbing, job searches from this channel now exceed 1 billion per month. To target candidates, recruiters should ensure their websites are mobile-friendly and create useful apps that can aid the recruitment experience. So, what did you think of your results? To see the full EmbryoGraph, click here. For additional advice on how to improve your website’s performance, please call our dedicated SEO specialists today on 0161 327 2635. Hannah is an imaginative Content & Marketing Manager, consistently crafting well-written work. She loves watching comedies and is an avid photographer.